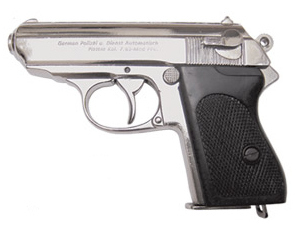 First introduced in the 1930s, the PPK is used by police forces worldwide, but it is most famous as James Bond's handgun of choice, which is ironic, since Bond is a fictional character. 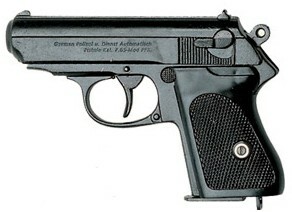 The PPK was also the sidearm of choice for another man who unfortunately wasn't fictional. In fact, it was Hitler's personal PPK with which he chose to kill himself, in his Berlin bunker as Russian troops closed in on the city. Our replicas have working slides and removable clips. To order, choose the finish from the drop-down list, then click "add to cart."